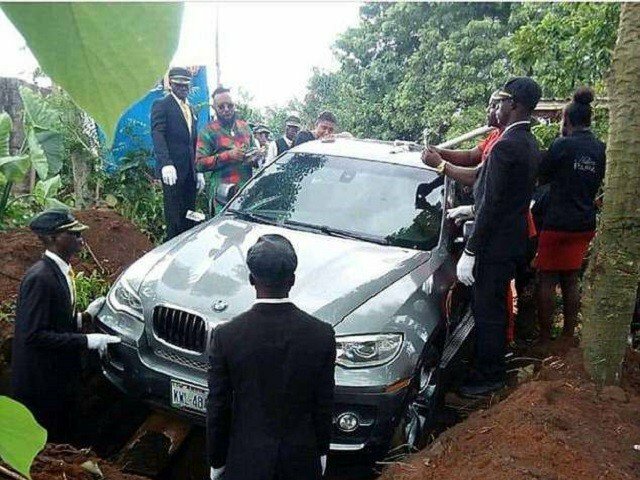 A man laid to rest his father in a brand new BMW car instead of a coffin in Nigeria on Tuesday, Mail Online reported. The wealthy son, Azubuike, lost his father to old age but he had always promised him that he would have a luxury car. So, after he passed away in the remote village of Ihiala, Azubuike spent £66,000 cash on a car from the showroom to bury his father in. A photo taken at the ceremony shows the vehicle being lowered into a huge grave dug six feet deep by hand in the village. The picture has gone viral on social media as pall bearers reportedly guided it down logs into position and then the logs were pulled out to allow the vehicle to drop. Locals quipped that the BMW is equipped with Satellite navigation to help him find his way to the pearly gates. In 2015, a similar burial made headlines after an Enugu billionaire buried his mother in a brand new Hummer and in the same year a man was buried in his favourite car in China.